In the run-up to the climate talks in Paris, November 2015, the world economy seems to have hit a predicament: restricting fossil fuel burning at a time when austerity measures are biting hard might lower the already less-than-acceptable standards of the least advantaged. Waiting with restrictions on the other hand will risk climate system disruption –and negative effects on the economy – even further. What courses of action are reasonable in this situation? How does the societal system need to change? Can the problem be part of the solution? Environmental Fiscal Reform (EFR) needs to happen – that is, economic policy is needed to underpin the rapid change and redistribution needed. This article breaks these challenges down, offering a broad outline of the direction of changes that need to happen over the next 35 years using Sweden as an example. We explain where (EFR) can contribute, and what economic policy makers should aim for so the appeals from the scientists can be translated into a sustainable and fair economic reality. One aid to visualizing the energy transition challenge is as a set of wedges that frame the changes ahead. Given that fossil fuel intensity in the economy must be reduced radically, we can assume this will have wide-ranging effects on other aspects of the economy and energy provision in particular, hence several different types of “wedges”. Capturing the extent of this transition can be a useful first step in framing economic, particularly environmental fiscal, policy. The concept of a shortfall of in energy availability, first developed by Hirsch. 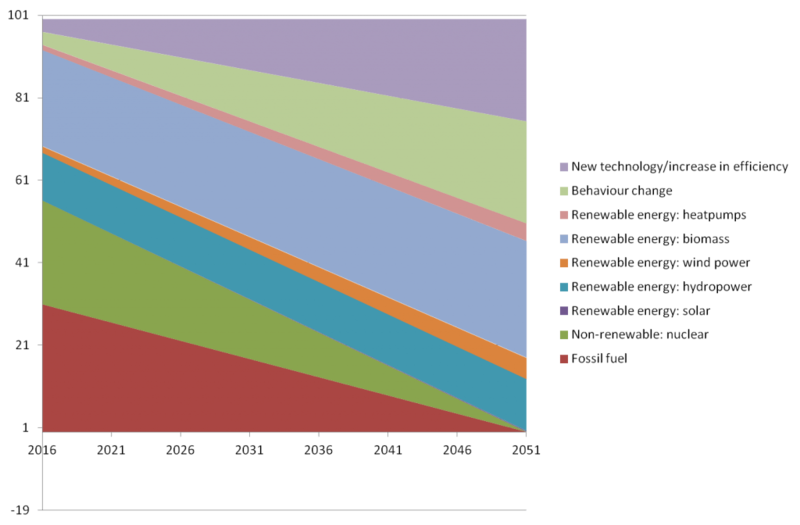 The wedge approach to energy intensity reduction in the economy was pioneered by Robert Hirsch in the Hirsch Report (Hirsch, 2008). The diagram above illustrates the principle: the demand for fossil fuel is likely to increase, but the extraction shortfall means that demand will not be met creating an unfilled gap, the shape of a wedge. 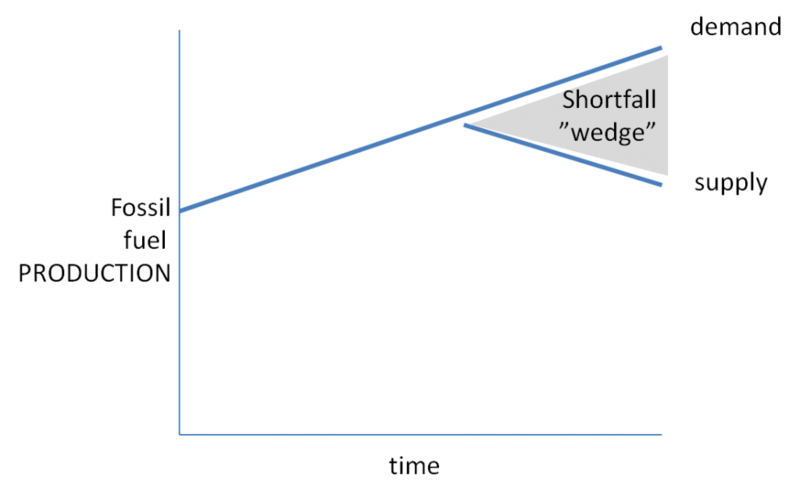 This “wedge” can be mitigated according to Hirsch, using a range of options for replacing fossil energy sources and reducing demand. The various mitigation options can be presented as separate wedges. 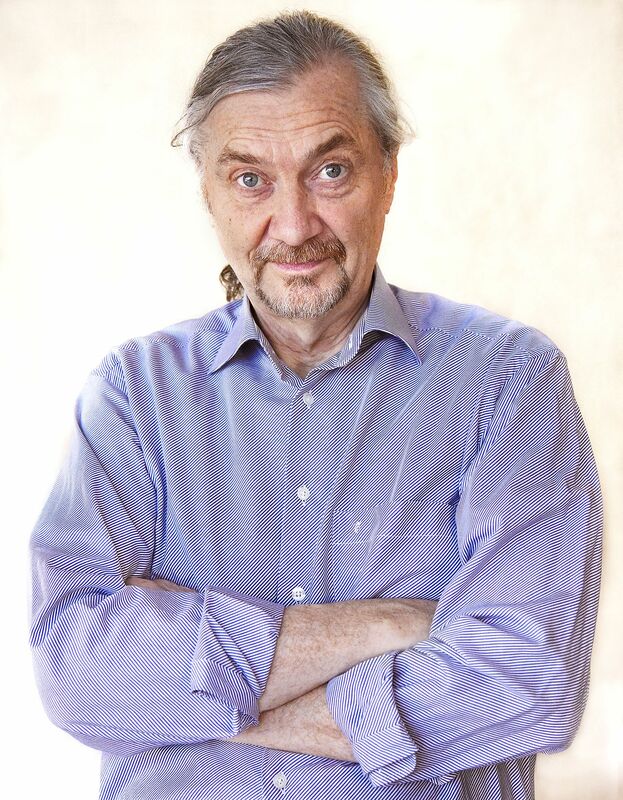 The Swedish Sustainable Economy Foundation maintains that these wedges cannot be realized without adaptations of the economic system. To understand the concepts we offer the case of Sweden as a worked example. According to our analysis for Sweden, there are 9 “wedges” to consider. The diagram below illustrates the scenario where energy demand reduces 50% over 35 years, fossil and nuclear energy are phased out completely and alternative energy sources are introduced or increased. The wedges are a synthesis of opinions and figures taken from a wide variety of publicly available sources but are offered here just as a worked example and do not represent any government policy as a whole or even a comprehensive proposal from the Foundation. This approach can be seen as a working start. Our starting point is that at present the Swedish economy, from the point of view of being capable of handling limitations in oil supply, has developed an over-dependency on oil. This dependency is understandable as oil-based liquid fuels are a highly energy dense and easily transportable energy source. No current technologies can replace this energy source scaling up in the time available or using renewable resources available. Some calculations assume that within the time-frame it will be possible to keep the same energy intensity. The Foundation however takes as its starting assumption that a 50% reduction is reasonable over 35 years. In terms of living standards, that would put Sweden on a level where it was in the 50-60s. As a first guess, taking Sweden as an example, we envisage that it will be possible to reduce demand with technological fixes by 25% over the 35 years. Import to note is that increasing efficiency – of engines or machines – normally involves them becoming more popular and overall energy consumption increasing. Refrigerators, for example, are more efficient, but people nowadays usually buy larger refrigerators so the total energy spent on refrigeration is more, despite the efficiency gains. With the example of Sweden we should be reminded that the cold climate demands energy to heat homes, crucial during the winter, as well as the energy needed in food preservation and conservation. This is where the emphasis on home heating – via biomass, solar collectors and heat pumps – comes in the following analysis. Another important lesson from this worked example is that the losses in energy – from that produced to that used are in the order of magnitude of almost 200 TWh lost in a production of 580TWh. The bulk of these losses come from nuclear power (108TWh) so abandoning nuclear power will reduce the percentage of energy lost considerably. In this case, economic incentives and barriers need to be in place to ensure that efficiency gains are not used to increase energy consumption. The final section of this article discusses policy instruments that might achieve this. 25% of today’s demand reduction could come from changing behavior, using existing infrastructure. It is reasonable to assume this can be done over 35 years as the potential is there. For example: by sharing cars for lifts to work, the overall traffic in the morning commute could reduce by 50% if everyone shared. Recent statistics show, too, that up to 50% of food produced is wasted. Heat in pumps extract heat from expired air, the surrounding air or from the heat in the ground. For every unit of electricity used they gain about 8 units of heat. Increase in heat pump use would therefore mean a rise in the use of electricity for this purpose and require more electricity produced by solar, wind, biomass or hydro, or equivalent savings elsewhere. In this worked example we envisage heat pump use increasing by about 400%. Biomass captures the energy from the sun and is a good potential energy source. 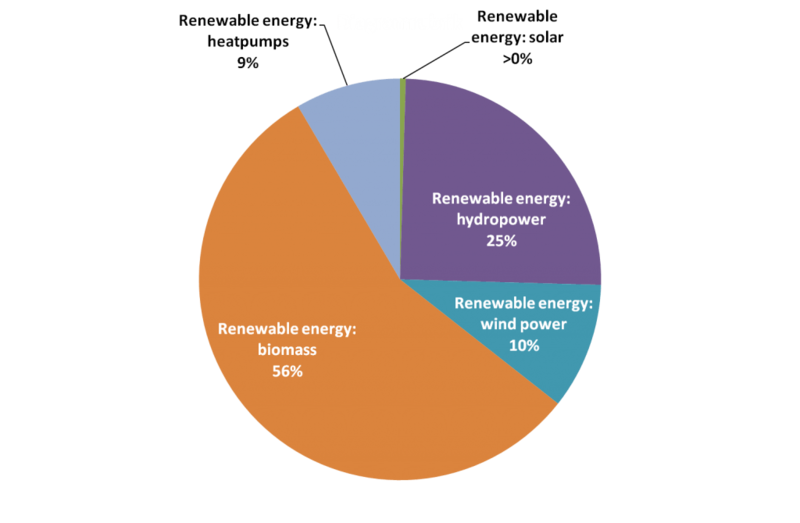 Biomass sources include many forms of waste, firewood and biogas – the latter can produce electricity as well as being used for heating and as a liquid fuel replacement. Some buses already run on biogas – we envisage a rapid expansion over the 35 year period by about 25%. Windpower produces mainly electricity, (some proponents suggest that the rotating blades can be attached to paddles via gears and the friction of the turning paddles can produce hot water). Hoping that wind technology can develop rapidly, our worked example calls for an increase of 400% in wind power. In the Swedish scenario it is generally accepted that the large hydropower installations that regulate most of the large rivers in Sweden should not be extended. The installed base of hydropower is therefore expected to grow only slightly from smaller installation possibilities. 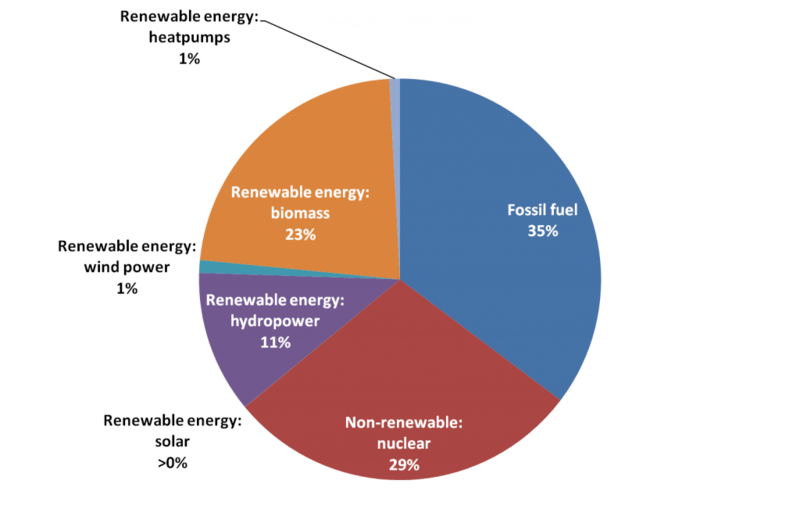 Unexpectedly for some, solar power does not show up in the graphs of Swedish energy mix as the present installed base is a small percentage of the total. It is however an important source of electricity and heated water and expected to grow over a thousand percent. Sweden decided in a referendum to phase out nuclear power, so an initial assumption is a gradual phase out over the 35 year period. Sweden currently produces about 206 TWh from fossil fuels, about 110 TWh goes into the transport system. It might be reasonable to assume that the fleet of fossil-fueled vehicles could be retired, replaced or converted to renewable fuels within the 35 year period. It is remarkable at first sight that solar power, photo-voltaic in particular, shows up as being so small it is almost counted as zero in the overall mix. In 2014, solar accounted for 0.06% of total electricity production. Even though solar shows up as this small fraction in the overall energy mix, there is potential for a panel to be installed on virtually every roof. The technology is available now, and is becoming better and cheaper. So although the percentage of the mix is small now, the percentage of solar electricity and solar heat for each building is potentially large. In other words, taken on a house for house or building for building basis, it is reasonable to assume that today’s 85% reliance on non-renewables can drop rapidly during the time period under consideration. Although the overall challenge might seem insurmountable, it is more encouraging to see the year on year changes required amounting to less than 25% year on year. Technology has come a long way, and might offer solutions to creating an economy that performs to requirements. For example, transport vehicles today are based on technology that is over 100 years old. However, they are much safer, respond better to driver commands, are more efficient and environmentally safer today even though the basic technology – including that of the internal combustion engine –is the same. These developments in the vehicle industry point the way to what might be possible with the economy – to use modern information technology to ensure the economy performs to requirements. Digital control plays a large part in this development. Today, vehicles are equipped with digital control devices that monitor vehicle performance and adapt it according to driver input. Apart from the obvious controls like speed control, this control layer keeps the engine running smoothly and efficiently, it ensures that the breaks do not lock to cause skids, and even in a bend in the road adjusts the relative speed of the outside wheels to the inside wheels thus increasing traction. 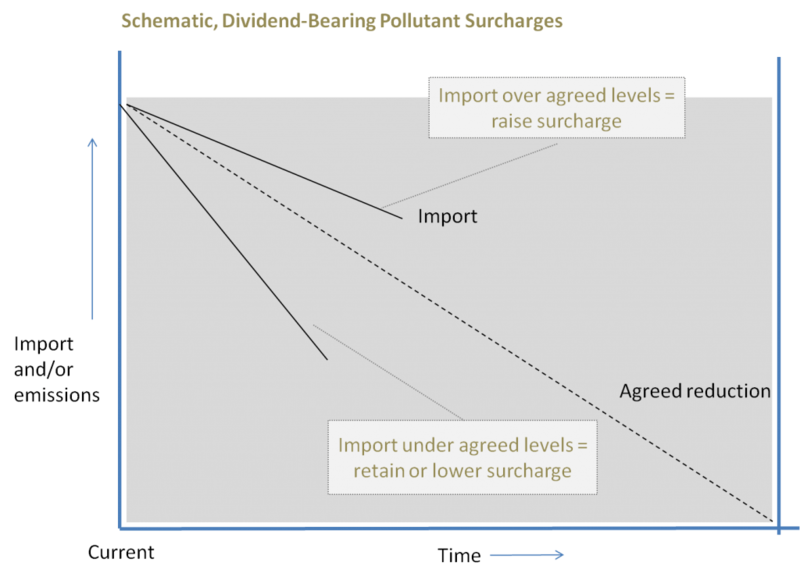 A dividend- bearing pollutant fee mechanism, also known as flexible pollutant fees has been proposed by many economic policy experts, including Anders Höglund of the Swedish Sustainable Economy Foundation. The principle of the fee mechanism is a surcharge added to the fees levied when a potential pollutant is introduced to the economy, for example via extraction, import or manufacture. The fee starts off low, and is raised depending on how society performs to abate the pollution arising from the use of the pollutant. At the same time, money from the levied is fee is paid back to taxpayers to ensure that spending power, and thereby economic robustness, is unaffected by the levy. As the fees levied are passed on to consumers, prices of pollutant-containing products rise in comparison to non-pollutant products and services. Consumers will be still able to choose to buy the more expensive product but with a good conscience that they are compensating others for the pollution from the consumption. Otherwise, non-pollutant bearing products become comparatively cheaper providing the economic incentive for society to invest in non-polluting alternatives. The surcharge levied on import into the economy is paid fully or in part back to taxpayers. The charge is adjusted regularly depending on how well the economy lives up to agreed emissions targets, being raised if performance falls behind. Similar to base lending rates, it is envisaged a government body is formed to regularly raise the surcharge levy as needed. As the mechanism employs modern information technology it ensures that the information acted upon is up to date and relevant. All actors benefit in the long run from a sustainable, robust and well-performing economy. The redistribution mechanism will in practice mean an increase in economic security for the poorest citizens: this is in contrast to other approaches which will reduce the poor’s spending power. By making pollutant import more expensive, the mechanism encourages green consumption and green jobs. It also encourages new investment in recycling technology, ushering in the circular economy. It is preferable that citizens spend the money they have, rather than invest it in assets like houses and shares, as every penny consumed creates more work and thereby more jobs. Levying a fee on activities that pollute, and paying it back to tax payers ensures the economy is stable, advantages the poor, and sends a strong signal to the investment community on where their money should go. Surcharges on import of fossil fuels and on nuclear fuels, aimed to drive a 35 year phase out. A surcharge on all products levied according to fossil-fuel consumption in the production and distribution to national borders. The wedge approach, then, can be a useful tool for sorting out national energy strategies at high level. The flexible fee mechanism can be employed to ensure consumers continue to purchase in general, thus preserving employment, but finding environmental solutions cheaper they drive a green economy. To help further understanding of the potential of fees on pollutants the Foundation offers a simulation run a kind of business game. Read more about the simulations here. The Foundation collaborates with a wide range of experts and universities. If you are interested in exploring the potential of using the wedges approach, please contact us. Hirsch, R. L. (2008). Mitigation of maximum world oil production: Shortage scenarios. Energy policy, 36(2), 881-889. Is big data and the big network helping humanity reach new heights? Amid the signals that capitalism is failing and the climate collapsing I wonder if there is not something very positive happening, too.